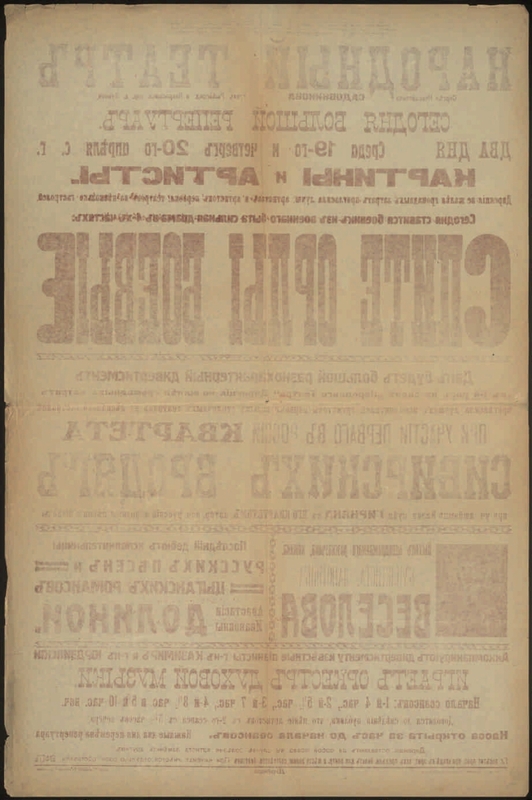 Electronic reproduction of the poster: Sleeping fighting eagles: today an insurgent from military life is put on: a strong drama in 4 parts: there will be a large rachno-character divertimento: with the participation of the first quartet of Siberian vagrants uch. favorite Kazan. pub. The duckweed with his quartet. Ex. Russian folk songs and bylinas: the release of an inimitable narrator, comic bookwriter, lapotnik Veselov: the last debut of the singer of Russian songs and gypsy romances Anastasia Ivanovna Dolina: the well-known pianists Mr. Kazimir and Mr. Yurdzinsky accompany the divertissement: plays the brass band: Wednesday 19 th and Thursday April 20 with. g.: paintings and artists: the management did not hesitate to pay enormous expenses for the best. artists and actresses pervokl. theaters for several tours [Izomaterial]: People's Theater of Sergei Nikolaevich Sadovnikov, corner Rybnorjad. and Nekrasovsk. trans. Zuevoi village. Kazan: printing house of the Provincial Government, 1917. 1 sheet: tsv. font (red); 93x62 cm. Location: Ros. Institute of Art History. Movie room. I. 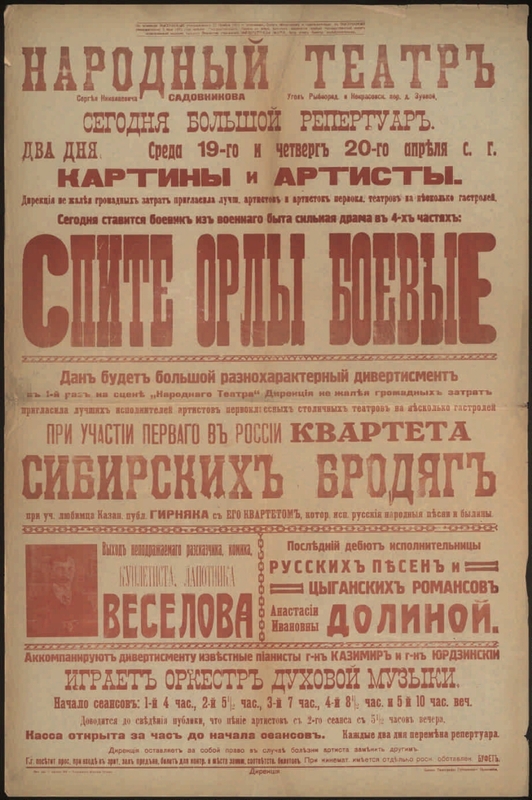 The People's Theater (Kazan) .1. "Sleep Eagles fighting" (feature film) - Posters. 2. The year of Russian cinema (collection). 3. The people (the collection). 4. Feature films - Posters. 5. Variety Russian - 20 century. - Posters. 6. Posters.